- I found a broken green wire soldered to the "on" switch underneath, which was a ground downstream and re-soldered that. - The orig owner installed an external "coin" insert button on the outer door for credits. - I tried (power off first) removing display board cables 1 by 1, to no avail. - I replaced the 69VAC fuse after the transformer on the bottom board to this power board with the correct 1/4 amp slo blow. No workie. I also verified the integrity of the underside of the fuse holder, block, fuse clips, etc. - I tested the J3 connection on the power supply board, with the plug unplugged, and power on. The 60v on the positive, and grn pin 5 for the neg as the guides describe. At first, I had 2-8 volts, which quickly dissipated to 0. Since then, I get 0 volts on the 42 or 60v pins. Obviously at this point I can tell that the power for the displays is not even getting TO the new power supply board, but failing somewhere beneath. I checked the wire plugs from the bottom board to the upper twice. I tried disconnecting the J2? (the one going to the CPU board from the power supply board, before the displays) with the power off, powered on, and tested the pins again to avoid drain, still no juice. Since the fuse block is not at fault, something below is keeping the power from getting to my new power supply board. I visually and physically checked each wire, solder point, ground, etc. following the path. I am not an extremely experienced electronics engineer however, so I am at a loss on what else to check from the transformer to the power supply board. Any help would be much appreciated friends. The game plays perfectly in all aspects other than all 5 displays being out. All sound, general illum, coils, mechanical parts, game modes, and additional lights "ball i play" etc. work, so it is very specific to the power that provides the 60v/42v display current. 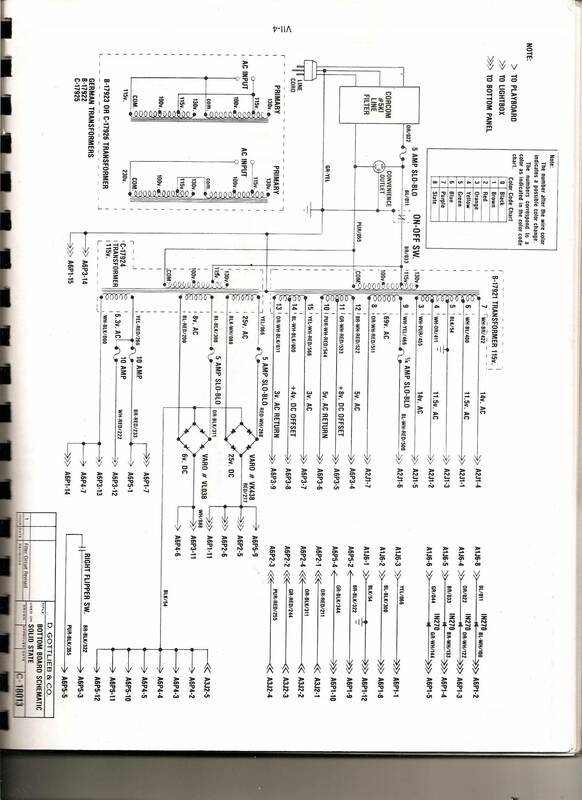 I understand the sys1 schematics fairly well now. Possibly you have a shorted display? I don't think that helps friend. I have tested the power coming OUT of, and into the Power supply board, with the cables going to the display boards disconnected. No shorting displays would affect things when they arent connected. I am getting 0 voltage coming out of the J3 pins from the new board, or the original board, period. There is something happening prior to the power supply board. on the power supply bottom connection, the 2 most right side pins should read 68V AC when you put each probe into those pins. its AC , so there is no ground reference, just those two pins. make sure your meter is set to AC. you can check all this with the plugs connected, its easier. make sure your probe tips are small enough to make contact on the pins in the connector. if you have 68v AC there, you need to check the DC output on the right side connector. to do that, you have to use the ground pin on the TOP connector . do not use the ground( or common) pin on the right side connector to check for 68 and 42 dc. that pin is to check for the 4 and 8 v dc. while you are checking voltages, make sure the 4 and 8 are there too. if you dont have 68v AC going in, its a simple circuit from the transformer, along with the 1/4 amp fuse . Did you check A2P1 pins 6 and 7 for ~ 69 VAC? Make sure you have 69 VAC here. Next, if 69 VAC is present, measure A2P3 pin 1 to pin 5 for ~ +60VDC. Next measure A2P3 pin 3 to pin 5 for ~ +42VDC. The displays also need +4 and +8 VDC to work. Measure A2P3 pin 7 to A1P2 pin 5 for ~ +4VDC. Measure A2P3 pin 8 to A1P2 pin 5 for ~ +8VDC. contacts number 8 and 9 for ~ 69VAC. If no 69 VAC, suspect the transformer. continuity from the fuse holder to A2J1-6. Check continuity from transformer contact number 8 to A2J1-7. I checked the bottom cable connector on the power supply board again (Attached) with power on (A2J1) and neither of the two right pins had any AC at all still. That definitely verifies why nothing on the right cable (DC) had any on the outbound side. 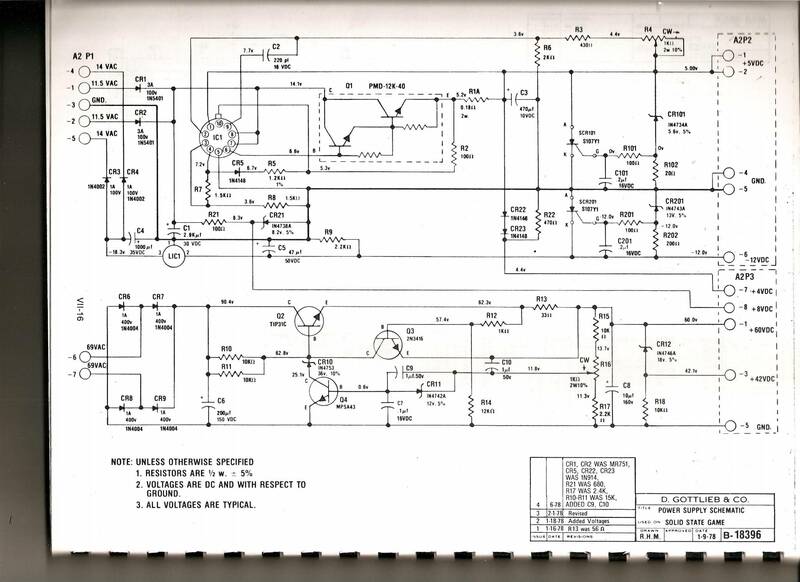 I do not have the original manual (haven't been able to find one - stupid Gottlieb), but I do have a lot of System1 troubleshooting guides, pin improvement info, and some large guides printed out. I did figure out that the smaller of the two transformers is B (hence the lettering I'm sure), and the side of the transformer facing the outer wall on the right showed .7 on a 200VAC setting when touching the AC probe to the top-most solder points on either side of the right-side of the transformer. I am guessing this is the equiv. of 70VAC (it fluxuated between 6-7, so prob 69V is accurate). If that is the case, then transformer B appears to be OK on current. I did notice one wire on the transformer that was missing solder (someone had looped a wire over the contact point), and hit it with a spot of solder. I tested the brand new 1/4amp slo blow fuse for continuity, and it was fine. I tested all the other fuses at that point, which were original, just for kicks, and they were also fine. I am uncertain how to "test the continuity between the fuse holder and the cable connection to A2J1" from this point. When you say "A2-P1", is that the cable connection underneath, connecting the bottom PF to the Head? Those two cable connectors are not labeled, which is why I am asking. The ones in the Head all have labels, and are A's and J's. At what points specifically do I test the continuity from the fuse holder to the A2J1? Do I do it with the power on or off? Also, what to do to resolve troubleshooting findings from the fuse to the head? I can't imagine it would be anything other than a bad wire connector, ground, etc. at this point. Unless some resistor or something else on the bottom board is in between them. I tried to follow the wire colors from the 69v 1/4 amp fuse to the transistor and beyond, but the wire bundle becomes a bit dense at that point. I appreciate all your help guys. I have this, and a Flight2000 with a hackjob of wiring blowing fuses to work on, as well as two rare EMs, and can't wait to finally get the hulk fully functional again! No you are not measuring correctly. With your DMM set to 200 VAC scale, you should be reading ~ 69 VAC at the B-17921 Transformer contacts numbers 8 and 9. Not .6 or 7 VAC but ~ 69 VAC. No not those connectors. A2P1 is the connector at the power supply. So when I say check A2P1 pins 6 and 7 for ~ 69 VAC, it the A2P1 connector at the power supply. Same as when I say measure A2P3 pin 1 to pin 5 for ~ +60VDC. A2P3 is the connector at the power supply. Next measure A2P3 pin 3 to pin 5 for ~ +42VDC. You do this with the Power OFF!!! You set your DMM to the lowest OHMs scale on the DMM. Remove the 1/4 amp fuse from it's holder. Place a probe at A2J1 pin 6 and place the other probe to the Fuse holder. On one side of the fuse holder you should read ~ 0 OHMs and on the other there should be a high resistance or your DMM may display OL for Overlimit. Next with the fuse still out measure from B-17921 Transformer contact numbers 8 to A2J1-7 for ~ 0 Ohms. Do you know how to use a DMM? So please take the above measurements and we can go from there. I happen to be working through the same issue on my Torch, but did want to note that PB resource had the Torch manual and also had the Gottlieb solid state repair manual for system 1, which has TONS of detail. Good luck, I expect to dig into mine starting at the small transformer tonight. Sorry for the very late delay, but in case anyone follows this thread later, I wanted to post the resolution. Hulk was the first pin I got to work on at that level (one of my very first rehab jobs). I did get it all working, and donated for free play at the Expo in Wheeling last year. It got a lot of plays! It turned out that I needed to re-solder a couple of the connection points to Transformer B (Responsible for that odd voltage). It also had some display issues (had to turn it on for a bit, let it warm up, and then off and on again to get the displays working correctly. Otherwise it showed all 00's). This was due to an old capacitor just not getting "juice" for a while.